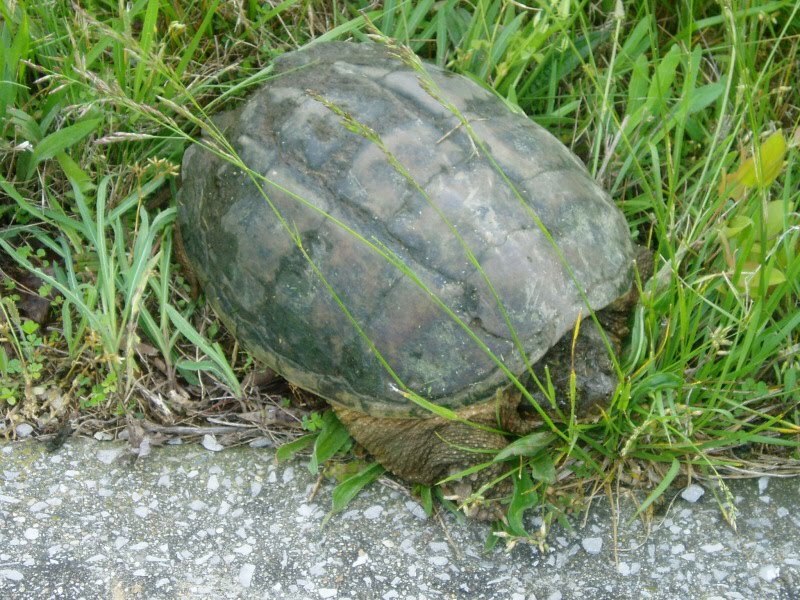 This turtle was injured and trying to cross my driveway and the road. I used a snow shovel to give him a hand and he was so big he would not fit. His front legs and head were at the base of the shovel handle. The last 1/3 of his body wasn't on the shovel at all. I had to use it like a lever to lift his back end off the ground and slide him to safety. He was not appreciative and launched at me several times. I am so disappointed that the size of this monster isn't evident by the picture. He was not the biggest I have seen but he was bigger than most. They wander down my road frequently and the way they walk they remind me of those things in one of the Star Wars movies. He was big enough to injure one of my inquisitive little dogs or me severely. If his back legs had been on the ground and not in the air while I sledded him to safety, his launches would have been successful and I would have been without one or more fingers. Next time I call a local and tell them their dinner is in my driveway. I am not quite ready to call the Turtleman. Are you ready for the Turtleman? Turretinfan, this video's for you!